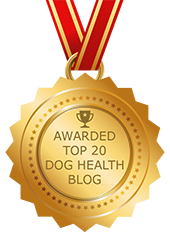 Alternative Treatments For Discoid Lupus Erythematosus (DLE) in Dogs | Dawg Business: It's Your Dog's Health! 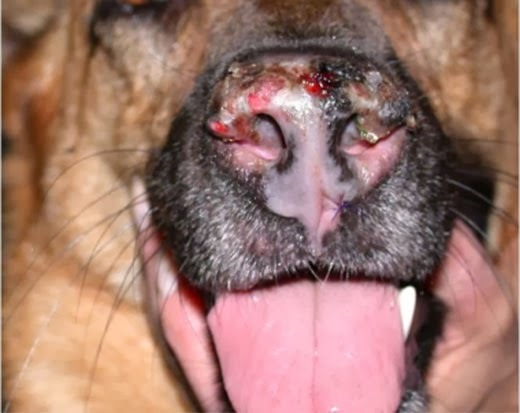 Discoid Lupus Erythematosus (DLE) in dogs is an autoimmune disease in which the immune system attacks the skin in the area of the face and specifically nose. The first signs are usually a loss of pigmentation around a dog's nose and an abnormal smoothness to the texture of the nose. In more advanced cases, red and flaky skin, ulceration of the skin, open sores and crusts can develop. Affected areas most frequently include the nose, lips, ears, the skin around the eyes and sometimes the genital area. However there are owners that would not like to treat DLE with the traditional therapies. Some dogs can not tolerate the antibiotics, other dogs have other diseases simultaneously in which the immune suppressive drugs could make worse, some owners just want a more holistic approach and lastly there are some dogs in which the traditional treatments just are not enough to keep the disease under control and owners are looking for more help. Topical herbal products that contain Calendula (Marigold) which has antioxidant properties and increases circulation. Calendula helps to heal wounds quickly. For use in DLE, it is the antioxidant properties which will help clear up the effects of the immune system attacking the skin cells. Vitamin E and Omega 3 and 6 Fatty Acids. These have natural anti-inflammatory effects and an affinity for skin so these products can help but usually cannot contain the disease on their own. More specifically, I personally use Standard Process products to help the body and the immune system. For a case of DLE, I would use Canine Immune System Support and Canine Dermal Support. Both provide basic support for the specific body systems. A controversial product from SP that I would use would be Dermatrophin PMG, which contains an extract from nucleoprotein-mineral molecules, which seems to neutralize circulating antibodies, which would help in slowing the progression of the immune system dysfunction on the skin. The main function is to maintain cellular health. Two of the more successful alternative treatments that have had success with treating some individual cases of DLE have been Homeopathy and Traditional Chinese Veterinary Medicine (TCVM). 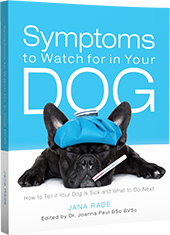 Both require the dog to be seen by a veterinarian certified in the specific medical modality. In both of these modalities, two dogs may have the same disease, such as DLE, but will be treated different. It is imperative that they are examined and treated based on the pattern that the dog presents. For example in TCVM, patterns are any combination of the following - deficiency and excess, heat and cold, blood, qi, yin, and yang. Most cases of DLE the pattern is a Blood Heat and would require an herbal combination such as Liang Xue Jie Du Tang, which clears heat from blood and detoxifies the system. However, in some cases, the pattern may be Blood Stagnation, and if that is the case, the herbal formula needs to be different such as Mu Dan Pi He Ji. This herbal combination has fewer herbs and is used to cool blood and resolve stagnation. OR the pattern may be a Qi-Blood Deficiency and requires a completely different herbal combination. The only way to diagnose which pattern the dog has is to have the dog examined by a veterinarian trained in TCVM. Homeopathy requires the same type of examination and treatment is based on exact symptoms. For the best success in treating DLE, using alternative treatments, please seek out the advice of an integrative or holistic veterinarian. DLE is a complex disease with complications of one of the most complex systems in the body- the immune system. You would want the best for your best friend so seek out a professional. The American Holistic Veterinary Medical Association is a good place to start to find a holistic or integrative veterinarian. Daniel Beatty, DVM (Dr. Dan) is an integrative veterinarian that believes in a holistic approach to medicine and wellness. He uses the best of both the allopathic and the holistic worlds of medicine to maintain a proper balance to health and movement for his canine and equine patients. He also blogs at Dog Kinetics and loves to teach pet owners his ideas through blogging and webinars. My 5 year old GSD girl had a horrible case. We went to multiple vets and nothing helped. I was crazy about it!! I prayed a lot,found an old article and tried sulfur 30x for 5 days and then switched to TemerilP7, a verylow dose, just 2 a day..... which they said would never be enough. Her nose is perfect and her smile is back! Praise God!!! I'm glad you found something that worked. Thank you for sharing that! Sulfur 30x would refer to a homeopathic remedy; the 30x indicating the dilution level.